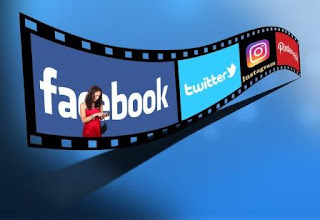 While going through your daily updates on social media like facebook and instagram many a times you come across the video which catch your attention but how to download those videos because these social sites do not give any direct option to download those videos. But there are many other ways, so that you can download your videos without any trouble and for that you don't need to be an expert or a computer geek.In this post i will show you how to download your favorite video form facebook and instagram. For the first step i will tell you how to use www.dredown.com you can also use any other third party website but this is much simpler and easier way to download also it is a fastest way .also is will be much easier if you open the social site on the browser you can easily copy the URL of the video if you open the site on an app getting the url would not be so easy. 1.Go to the video you have to download and hit the play button. When you’re already there, get the URL (this is the link address found at the address tab on top of your browser), highlight that and then press ctrl+C to copy. The URL should look like this https://www.facebook.com/photo.php?v=1409726992546968. 2.Another option is to right click on the video and copy the url to the clipboard. 3.Now go to download and paste the link which you copied in the dialog box and press download .it will ask where to save the file then wait for the download to complete . 4.Enjoy your video you can also convert your video in any media file as HD ,mp4 , 3gp or .mkv according to your wish . Moreover, you can also use www.fbdown.net to download Facebook videos the methods are the same you have to copy the url of the video and paste on the website select the folder to save the file,i guess this article helped you . 4-paste the URL in the dialog box of "internet download manager",or "facebook download manager" and then enjoy the video. If you have questions, comments, or suggestions, please feel free to leave a message below. https://www.downloadfbvideos.com/ is also a good alternative option to download facebook videos online. Tubidy is an amazing platform that allows you to save music files for free of cost. This safe and fastest Mp3 downloader lets you download audio files from YouTube videos directly. For this, you only need to copy the source URL and paste it on the Tubidy website. Não é a net que determinará sucesso da sua empresa. I am a music lover. I found many sites for downloading and converting but tubemate is the best for unlimited downloading. You can also use snaptube. its a free site. You can also download Snaptube App. MP3xd is a very good platform for free and unlimited YouTube video downloading. You should also include this Facebook video downloader fbvideodownloader.cc. Thanks. Sorry Shashank Shukla I don,t have any idea to download youtube and instagram video but i have a good way to download videos in youtube to many formats.youtube downloader hd download youtube video from her because They are fast, secure and easy to use.